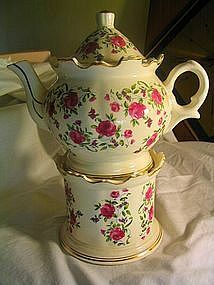 Vintage 32+ ounce chintz teapot with warming stand and mini-cup holder for tea light. There are no chips, cracks or breaks. 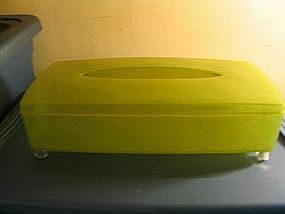 There is some crazing and one area on the lid where there is a small loss to the gold trim. I need your zip code to calculate the postage. This vase is almost 6" in height 2 1/2" in width. A quality piece. There does not appear to be any damage of any kind. 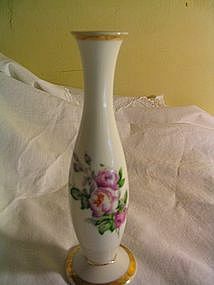 If you have any questions regarding this vase, please e-mail. I need your zip code to calculate the postage. I am not sure if this is truly the original "Moss Rose," but the term seems to used these days for several rose patterns manufactured in Japan. It is 7" in height and 2 1/4" at the base. There are no chips, cracks or breaks. There is a tiny amount of loss to the gold trim, but you must look for it. 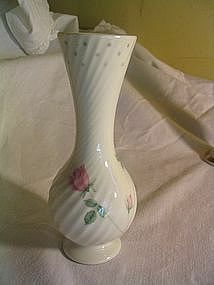 If you have any questions regarding this vase, please email. I need your zip code to calculate the postage. The bowl is 10" and as you can see from the backstamp is occupied Japan. There are no chips, cracks or breaks. There are some manufacturing flaws as all of this pattern had. As far as I can tell, there is no damage to the finish other than the afore mentioned manufacturing flaws. I will be glad to take photos of any specific area for interested parties. Please email any questions. I need a zip for postage calculations. Insurance is a must for this bowl. Unusual shape for a steamer, unless it was meant for a specific purpose. 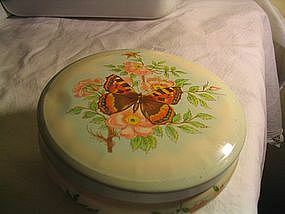 It measures approximately 7" x 6" x 3" (excluding handle and knob of lid). 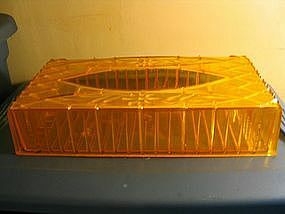 This is a very light weight pan, especially the lid, which has some dents. 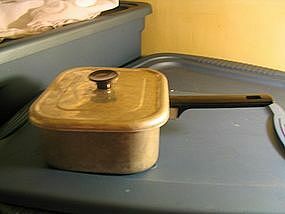 The body of the pan has no dents. It was manufactured in Taiwan. If you have any questions regarding this pan, please email. I need your zip code to calculate the postage. 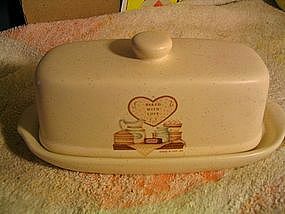 This vintage pan measures approximately 12 x 7 1/2 x 4 inches. 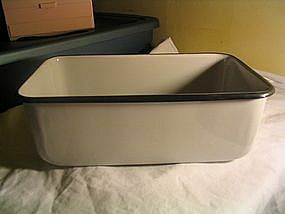 It is shaped like a loaf pan. Very little sign of use and no rust or dents. I need your zip code to calculate the postage. 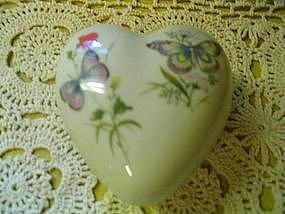 Beautiful tin box 5" across and 2" in height. There are several small scratches and a few dents to the lid. There is no rust on the outside and the inside is not rusted but is slightly discolored. If you have any questions regarding this item, please email. I need your zip to calculate the postage. 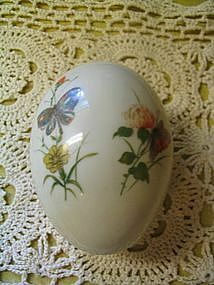 This 4 inch tumbler is part of bath ensemble. 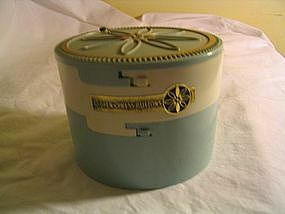 It is Lefton stamped 8182 and retains paper label. There are no chips, cracks or breaks. The finish is just fine except there is a tiny loss of gold trim. One must look very carefully to see this loss. If you have any questions regarding this tumbler, please email. I need your zip code to calculate the postage. This is such a unique box (no razor). It is easier for you to look at the photos than try to describe it. There are no product numbers to match to a razor. The opening mechanisms work smoothly with a nice tight fit and lock with ease. There are no chips, cracks or breaks. There is a bit of paint loss which you see in the photos. I will be happy to answer any questions regarding this item. I need your zip code to calculate the postage. 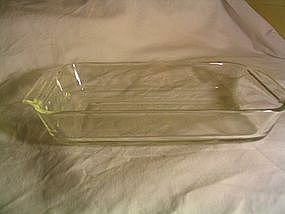 This vintage loaf pan is marked as CC-24 and measures 8 1/2" x 4 1/2" x 2 1/2" and is not marked for microwave. No chips, cracks or breaks. A few light use marks on bottom. I need your zip code to calculate the postage. 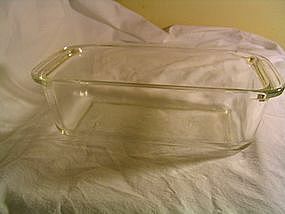 Vintage Anchor Hocking Fire King oblong baking pan measuring 12" x 6 1/2" x 2" with a 1 1/2 quart capacity. It is marked 432. 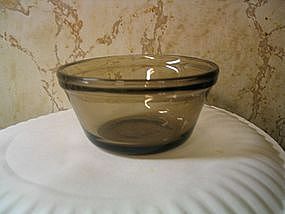 Keep in mind, these older pieces are not marked as safe for microwave. No chips, cracks, breaks or rough edges. There are a few superficial scratches, but not an excessive amount. If you have any questions regarding this pan, please email. I need your zip code to calculate the postage. This box is part of the Takahashi Dew line. 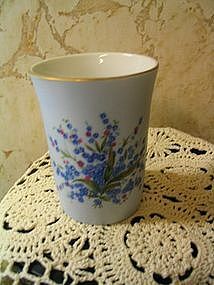 The quality of the porcelain is lovely. 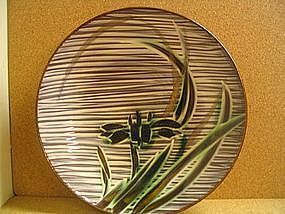 It measures approximately 4 1/2" in length, 3" in width and 2 3/4" in height. There are no chips, cracks, breaks or repairs. The finish does not show any damage. If you have any questions regarding this item, please email. I need your zip code to calculate the postage. Box has a slide out bottom piece, which allows it to hung on the wall if one wishes to do so. It measures from the outside 10 1/2" in length, 5 1/4" in width and 2 3/4" in height. There are no chips, cracks or breaks. If you have any questions regarding this item, please email. I need your zip code to calculate the postage. 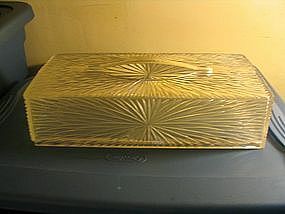 Quarter pound covered butter dish manufactured in Taiwan. There are no chips, cracks or breaks. The finish seems to be without problem, however, there are manufacturing flaws. I have a utensil holder available in this pattern for sale. If you have any questions, please email. I need your zip code to calculate the postage.